I am not convinced the write up is very well researched and it probably shouldn’t be used as a reference for other projects trying to do low resource designed website. and putting lead batteries into into wooden boxes could be a really stupid idea. 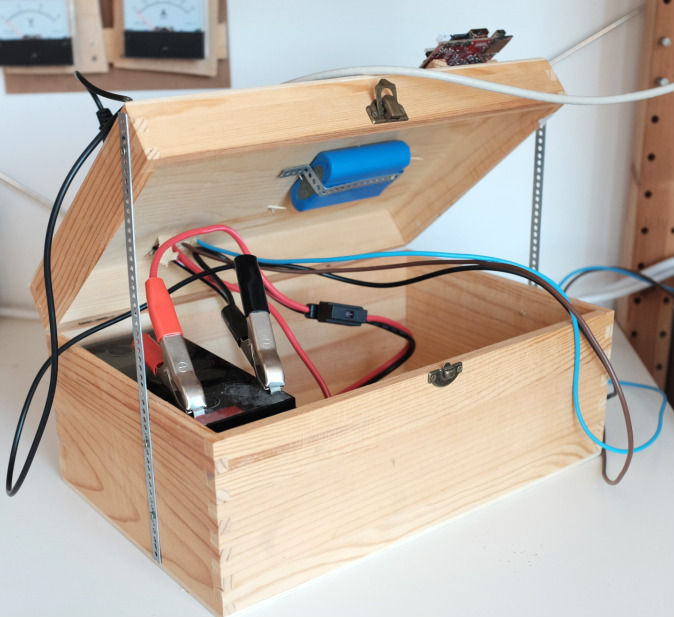 What happens when you put lead batteries in a wooden box? Hydrogen gas and oxygen gas mixed together in a closed space. In this case a box that is kinda flammable. It’s just begging for a spark, unless it’s a “Sealed Lead Acid” battery. Those are SLA, but they have a pressure valve that can release gas (and acid spray) if the battery boils over due to excessive charging voltage. That’s why my bank of cells has positive ventilation. In fact, it was mandatory. I worry more about that blue LiPo pack in the wooden box than the SLA. IT is a myth That lead Acid batteriets areal bombs. As Long as the enclosure is not completely air tight, there is No risk of hydrogen Collecting. I was referring to text describing how to make a low energy/footprint website, rather than the choice of batteries, solar cells and hardware. Would love to see a more rigorous writeup to substantiate some of the claims and exploring alternatives. For instance the energy impact on the server per MB transferred and how various changes improve the efficiency. The same could be applied to each of the hardware components selected. The article just needs more rigor and scientific method applied to it. You could save money on the controller (and use that money for more PV and/or bigger battery) by using voltage-regulated PV panels. They’re designed to limit peak voltage to about 14 or 15 volts instead of ~18. Of course *I* use a controller because I’ve got ~1320ah of battery to deal with. I would supplement the power generation with wind power. I live in close proximity to wind turbines, so the are is quite windy. I was thinking of doing a wind turbine myself. I just didn’t know what to power. Perhaps a small weather station with web server. I know it’s not what you meant, but reading this “I live in close proximity to wind turbines, so the are is quite windy” really did make me think of the people who think the wind turbines produce the wind. I’ve also built a small solar-setup, though I’ve gone with an 85W panel, a Wincong SL-03 30A – controller, a bunch of salvaged 18650 li-ion cells and a 3S BMS. The battery-pack’s capacity is somewhere around 140Wh at a guess, though I haven’t bothered to properly measure it. At the moment I use it to run some LED-lighting outdoors at night, though I am planning to expand the battery-pack’s capacity and add some more coollies stuff to my setup, including a small PC. Kicking around a similar off-grid server concept myself just now. Been fiddling about with some used 18650 Li-Ion laptop battery packs, and scoffing at all the ‘over-charge protect this’, and ‘over-discharge current protect that’ stuff. Such an apparent minutiae of thermal sensors and temperature cut-outs, double layers of Kapton tape and an excess of other ‘superfluous’ insulators. I was both bemused and befuddled. Now what’s all this RTV goo keeping even static, mechanically robust wiring connections in place for? My attitude was one of complete derision. Then, last night, I made my first simple error. Gee, did that scene get waaay out of hand in a hurry, and compound itself far quicker than I could figure out how to deal with! Powerwall me not, Elon. Not even my neighbours…and I’m not even trying to be funny. “and scoffing at all the ‘over-charge protect this’, and ‘over-discharge current protect that’ stuff.” — Well, at least you learned that that was a bad idea without (apparently) setting your house on fire. While speaking of the devil (BMS), any intelligent but affordable BMS boards with “fuel gauge” like those used in laptop battery packs? Seems like there’s only dumb ones without things like estimated capacity reporting and etc, or they’re obscenely expensive. Sorry, can’t help you there. I went with a dumb one without any displays or any other fancy features because it was cheap and simple. Can always add capacity-reporting and stuff later on by slapping on an MCU and a current-sensing resistor. Me, I don’t need to know the momentary current-draw or such, I just like to know the voltage of the pack and I use an MCU to report it and the storage-room’s temperature and humidity over LoRa periodically. I bet it can be made to work on other systems besides the Intel NUC. It reports status over USB, supposedly showing up as a regular battery in the task bar as if you were using a laptop. Has all sorts of settings for attempting a graceful shutdown. They say that linux implementation is planned, I certainly hope so. It supports a very wide range of input voltage, so it would probably work with minimal extra solar management circuitry. There are higher capacity battery packs available, with very comprehensive Smart Battery Management system v1.1 compliant ‘fuel gauge’ chips on-board, but obscenely expensive doesn’t even begin to describe them. I stopped looking at smarter BMS boards for similar reasons. For a less expensive power system, and without having to go to all the fuss of designing one’s own protect, balance, monitor and control system, I proposed to use a bank of mass consumer grade laptop battery packs, with all the goodies already built-in. It’s then just a matter of building a sufficiently intelligent charge and discharge management system for the bank, driven by the wealth of data and control options that contemporary Li-Ion laptop battery packs nowadays provide, through their SMB (I2C) interfaces. I (sadly) figured as much. Currently working on repurposing some T60 and T61 ThinkPad BMS boards, the controller and i2c data output, configuration is almost fully documented with those, except they somehow can’t “tell” you the voltage of each specific cell over i2c as far as I know. While other BMS laptop boards have no problem doing that. I have done something similar to build a solar powered cryptocurrency miner, but with a 100W panel, a 12.8V, 82Ah LiFePO4 pack, and multiple cheap smartphones/old tablets plus a small mining ASIC. It did months ago, when the Swagbucks mining profitability was way higher than it is now. I also achieved a bit of fame with the setup and I’m proud to show it on my Facebook. There are proper connectors for those tabs on the battery. I absolutely love the lightweight “brutalist”/retro web design trend. We’ve increased our broadband connections and amount of RAM to truly science fiction levels, more than most ever thought we’d need just a few years ago. Yet we’re still waiting all the damn day long on slow and horrendously bloated, lazily coded websites. We’re loading pages that exceed then file size of a full Window 95 install just to read a few kilobytes worth of plaintext. Adtech and goofball form-over-function over-designing are strangling what was once a pretty straightforward and efficient medium. I forgot who said it, but it’s really true that software is a gaseous fluid–it expands to match the shape and volume of its container. Having a solar server introduces some lovely restrictions from which decent design is born. Is the Olimex processor the best for this application? Beyond the Raspberry Pi, what would people consider? Anything with power efficient and well designed HW and good software support works. 18650 cells are more efficient than lead acid. will keep the load going longer. A Raspberry Pi with a SSD is a good web server with low power consumption. Does lead-acid suffer from vampire drain? As far as I can tell “vampire drain” is a Tesla car thing, and it’s just a symptom of the standby power used by all the stuff other than the motors. Nothing to do with battery technology. Probably why I’ve never heard of it til just now. I thought you might have meant “self discharge” but that already has a name. Lead-acid is good because it can take a knock, it can take a lot of abuse, without any sort of real damage. And even severe abuse won’t cause it to explode. In rough use, it’s much safer than lithium technologies, and generally tougher. Also, and this is a guess, but I imagine it’s cheaper per AH too.